Camelot delights families with space – and impressive features. Memorable meals in the formal dining room start in the open kitchen. Meanwhile, just beyond the large gathering room, the covered lanai beckons. Downstairs flex space can provide a guest suite, and kids can play in the upstairs loft. The Owner’s Retreat (with optional wet bar) adds a private sanctum off the Owner’s Suite. 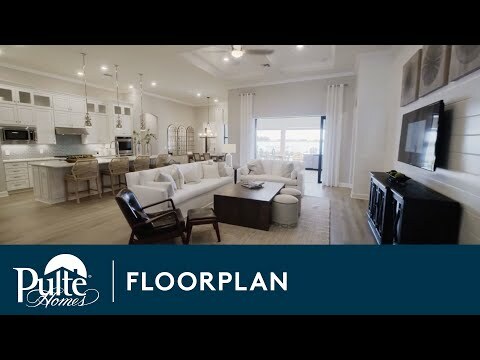 Step inside Camelot to see the Life-Tested Home Designs® with more usable space where you want it most. So you live the way you want to live. The Camelot is a wonderfully flexible floor plan that offers up to five bedrooms for large or expanding families. The stunning kitchen features granite countertops, elegant Moen® fixtures, tile floors, and a center island for food preparation or casual dining. An optional second story loft offers space for another bedroom with bath. Living is easy in the Camelot. Upon entering you are greeted by the connected gathering room with coffered ceiling, open concept kitchen, and spacious lanai. Escape to the owner’s suite, featuring a large walk-in closet and private retreat area.